Hey, can a squirrel get a lift around here? The answer is, in the case of the federally endangered Carolina northern flying squirrel, a resounding yes. The North Carolina Wildlife Resources Commission with the aid of North Carolina Department of Transportation, Duke Energy, U.S. Fish and Wildlife Service and the USDA Forest Service has extended a helping hand, err, pole – make that poles. 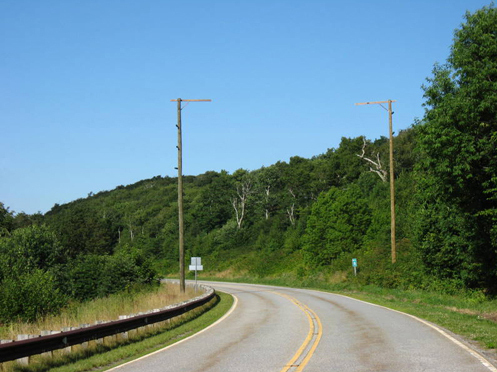 NCWRC and partners have erected three flying squirrel crossings along the Cherohala Skyway that runs from Robbinsville, N.C. to Tellico Plains, Tenn. The crossings consist of tall utility poles erected on either side of the Skyway. The poles serve as launching and/or landing pads for this small arboreal rodent whose preferred method of locomotion is gliding through the forest from tree to tree. The two subspecies of flying squirrels found in the Southern Appalachians – Carolina northern flying squirrel and Virginia northern flying squirrel – are both endangered. Biologists believe these two subspecies are relic populations of northern flying squirrels that were stranded in the fir and spruce forests of the high peaks of the Appalachians when the last ice age receded. The tawny red Carolina northern flying squirrel is about a foot long and weighs less than a pound. It is slightly larger than its ubiquitous gray cousin, the southern flying squirrel that is found primarily below 4,000 feet. The Carolina northern flying squirrel is found at high elevations (generally above 4,500 feet) in western North Carolina, eastern Tennessee and southwestern Virginia. It is known from nine locations in the state. The completion of the Cherohala Skyway in the mid 1990s essentially divided the Carolina northern flying squirrels of the Unicoi Mountains into two populations, one on either side of the Skyway. The northern flying squirrel can glide about 160 feet. The roadbed, right-of-way and shoulder maintenance along the Skyway created too wide of a canopy gap and telemetry studies showed that the squirrels were not crossing the road. Segmenting and/or restricting the movements of even healthy populations of wildlife are never good things. They reduce the gene pool and limit foraging, breeding and denning habitat. In the case of small, imperiled populations like the Carolina northern flying squirrel, such effects can be devastating. The flying squirrel crossings erected in 2008 are having a positive effect. “Carolina Northern flying squirrels have been documented using and exploring all six poles in three corridors along the Skyway. Spring and summer seem to be the peak time for dispersal, though we also have documented flying squirrels crossing in fall and winter, even during a snowstorm,” said NCWRC biologist Chris Kelly. Cherohala Skyway managers have implemented a “do not mow” policy at these squirrel-crossing sites. They hope to encourage native tree growth at these corridors so the poles can eventually be removed. These crossing poles are clearly having a positive impact but Carolina northern flying squirrels are seeing their share of negative impacts. These little critters depend on conifers. The conifers are not only used for food and denning but the conifer oil that is ingested when the squirrel feeds on conifer cones and fungi that grows on conifer roots seems to deter a debilitating intestinal parasite, Strongyloides robustus that can make the squirrel unable to reproduce. And conifers have been under attack for decades in the Southern Appalachians. First the balsam woolly adelgid decimated the Fraser firs. Now the hemlock woolly adelgid is doing the same to the eastern hemlock. The loss of high-elevation hemlocks in the Unicoi Mountains is especially troubling. Carolina northern flying squirrels have been able to rely on red spruces in much of their former spruce-fir habitat. But the Unicois loss their spruce-fir component four to five thousand years ago due to a slight temperature rise. The eastern hemlock is the only high-elevation conifer left in the Unicois and its future looks bleak. You can help NCWRC in its mission to protect the Carolina northern flying squirrel and other non-game species through the Tax Check-off for Nongame and Endangered Wildlife on your state income tax form. Checking line No. 27 lets taxpayers designate part or all of their state tax refunds to this fund. To learn more about the “squirrel crossings” and to see a couple of cool videos visit – http://www.ncwildlife.org/NewsReleases/110910_Endangered_Squirrels_Using_Poles_to_Glide_Across_Road.htm.